Norbert Kluge, “Worker participation in boardrooms throughout Europe,” in Rebecca Page, “Codetermination in Germany, a beginner’s guide,” Arbeitspapier 33, Hans-Böeckler Foundation, Düsseldorf, June 2011, Annex..
Employees in 18 of the member European States and in Norway have the right to have their interests represented in their company’s top management and administrative bodies…. They monitor day-to-day business operations, are involved in the appointment and dismissal of managing directors and influence investments of strategic significance for the company. 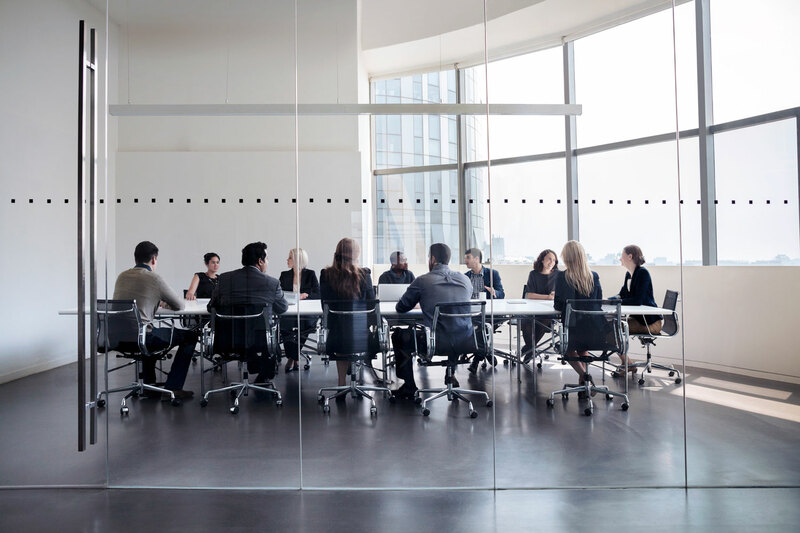 Employee representatives on the Supervisory Board have equal status with the representatives of the shareholders, and employee representatives on the boards of single-tier companies have the same rights and obligations as the other directors. European Trade Union Institute, “Updated map of board-level employee representation in Europe,” ETUI, 2016. The logic of democracy is that every American should have a voice in the running of the country including its most important institutions such as schools and work. Stephen J. Silvia, Professor, School of International Service, American U, 2018. We support [democracy] because we believe that everyone should have a voice in the governing of our country. Why shouldn’t everyone also have a voice where they spend the biggest portion of their waking hours, namely, at work? European System of Worker Involvement (Davignon Report), European Union, 1997. The type of labour needed by European companies – skilled, mobile, committed, responsible, and capable of using technical innovations and of identifying with the objective of increasing competitiveness and quality – cannot be expected simply to obey the employers’ instructions. Workers must be closely and permanently involved in decision-making at all levels of the company. Why Codetermination? Hans Böckler Stiftung, 2018. Co-determination defines a set of rights that give employees the possibility of actively participating in the shaping of their working environment. Some 51 percent of millennials in a 2016 survey did not support capitalism. OECD Position, “Divided We Stand: Why Inequality Keeps Rising,” 2011. First, globalisation had little impact on both wage inequality and employment trends. Even though trade flows between countries around the world have been increasing rapidly, companies have been investing more and more directly in other countries, and imports from emerging economies, such as China and India, have surged, these trends were not major drivers of inequality in OECD countries. Ozlem Onaran and Alexander Guschanski, “The causes of falling wage share: sectoral and firm level evidence from developed and developing countries – what have we learned?” University of Greenwich PB23-2018. Our findings suggest that workers have not benefitted as much as capital from the technological advancements in the production process due to the decline in workers’ bargaining power. Similarly, capital rather than labour benefitted from the efficiency gains of international trade. This suggests that the decline in the labour share can be reverted through a change in the institutional setting defining bargaining power and is not an inevitable outcome of technological change and globalisation. Josh Bivens and Heidi Shierholz, “What labor market changes have generated income inequality and wage suppression?” Economic Policy Institute, Dec 12, 2018. Figure A shows total labor compensation for the bottom 90 percent as a share of all market-based income in the American economy. In 1979, this share was 58 percent, but as of 2015 it had shrunk to just under 47 percent…. This collapse of worker power has been overwhelmingly driven by conscious policy decisions that have intentionally undercut institutions and standards that previously bolstered the economic leverage and bargaining power of typical workers; it was not driven by apolitical market forces. The job of management is to maintain an equitable and working balance among the claims of the various directly affected interest groups …stockholders, employees, customers and the public at large. No man with an inadequate wage is free. He is unable to meet his obligations to his family, to society, and to himself. No man is free who can provide only for physical needs. He must also be in a position to take advantage of cultural opportunities. Business, as the process of coordinating men’s capital and effort in all fields of activity, will not have accomplished its full service until it shall have provided the opportunity for all men to be economically free. The fact that unions represented one-third of the American workforce. [in 1944]… and a good deal more than one-third at major corporations, was overwhelmingly the main reason why corporations compensated their workers more fairly then than they have in recent decades. The contract that General Motors signed with the United Auto Workers in 1950, which set the template for the more equitable contracts of that period, came out of GM’s fear that it might have to endure another 100-plus-day shutdown that the UAW had inflicted on the company in its epochal 1946 strike. And as Jack Metzger has documented in his marvelous book Striking Steel, the 1950s were a decade suffused with major strikes as unions successfully fought to thwart corporations’ proposals that would have pared back the wage and benefit gains that workers had made. Martin Wolf, Financial Times, Dec 12, 2018, We Must Rethink the Purpose of the Corporation. How, above all, can such long-term trust be sustained if the constantly reiterated aim of the corporation is to serve the interest of those least committed to it, while control is also entrusted to those least knowledgeable about its activities and at least risk of damage by its failure? Yet, these are reasonable descriptions of the place of shareholders in publicly-owned companies with widely-distributed shareholdings…. In addition, given the mantra of shareholder value maximisation and the inability of shareholders to monitor management, rewards have increasingly been linked, not to the performance of the business in delivering on its purpose, but to accounting profits and the share price. Yet, both are subject to manipulation. Thomas Paster, “Do German employers support board-level codetermination? The paradox of individual support and collective opposition,” Socio-Economic Review (2012) 10, 471–495. Tammy Baldwin, “U.S. Senator Tammy Baldwin reintroduces legislation to roll back buybacks and to give workers a voice on corporate boards,” U.S. Senate, March 27, 2019. Staff Report that accompanied the reintroduction by Brian Conlan. Tammy Baldwin, “U.S. Senator Tammy Baldwin leads effort to give workers a greater voice at public companies,” U.S. Senate, Oct 16, 2018. Tammy Baldwin, “U.S. Senator Tammy Baldwin introduces legislation to rein in stock buybacks and give workers a seat at the table,” U.S. Senate, March 22, 2018. Elizabeth Warren, “Accountability Capitalism Act,” U.S. Senate, August 15, 2018. Elizabeth Warren, “Corporations shouldn’t be accountable only to shareholders,” Wall Street Journal, Aug 14, 2018. Christine Emba, “Elizabeth Warren is giving capitalism the moral rehab it needs,” Washington Post, Aug 30, 2018. Justin Fox, “Why German corporate boards include workers,” Bloomberg, Aug 24, 2018. Jesse Fried, “Trump and Warren offer the wrong diagnosis of short-termism,” Financial Times, Aug 27, 2018 (pay wall). Ralph Gomory, “Elizabeth Warren’s Accountable Capitalism Act isn’t radical – it’s a return to the roots of American economic prosperity,” The Hill, Sept 11, 2018. Samuel Hammond, “Elizabeth Warren’s corporate catastrophe,” National Review, Aug 20, 2018. Robert Hockett, William Lazonick, et al, “Supporting Senator Warren’s Accountability Capitalism Act,” Cornell U Law School, Aug 15, 2018. Dear Senator Warren, We are a group of long-term scholars and practitioners of the law, finance, and economics of corporations and other business entities. We write you now in support of your Accountable Capitalism Act. We believe legislation along these lines to be long overdue, and are confident that your bill will begin the process of both (a) correcting long-standing problems in American corporate governance, and (b) putting in place a system of incorporation that produces better outcomes for all corporate stakeholders, not just for elite executives and ultra-large shareholders. Susan Holmberg, “Workers on Corporate Boards? Germany’s had them for decades,” New York Times, Jan 7, 2019. These proposals are part of a fundamental rethinking of whom corporations should serve, but they are not new. Matthew Klein, “Elizabeth Warren has got it all wrong,” Barrons, Aug 23, 2018. Robert Kuttner, “Warren as progressive leader and teacher,” Blog, Aug 20, 2018. Harold Meyerson, “Elizabeth Warren proposes a second New Deal, The American Prospect, Aug 17, 2018. Warren Olson, “Sen. Warren’s confiscatory corporate governance proposals, Cato at Liberty, Aug 20, 2018. George R. Tyler, “Codetermination enters the American political debate,” Social Europe Journal, April 20, 2018. Codetermination is constitutionally embraced in northern Europe. And Supreme Court rulings such as Stop the Beach Renourishment v. Florida Department of Environmental Protection, 560 U.S. 702 (2010) indicate codetermination would not conflict with the “taking” provisions of the U.S. constitution. Codetermination enhances investor (debt holders and share investors) value: Larry Fauver and Michael E. Fuerst found that codetermination enterprises in Germany are more valued than others. Nor would codetermination appear to conflict with the National Labor Relations Act writes Erik Wulf. Labor compensation in nations adopting codetermination has leapfrogged America, growing one third faster in Germany since 2010. Adjusted for purchasing power, employees in Denmark, Germany, Norway and Sweden earn 9% – 59% more an hour than Americans. Total labor compensation per hour in manufacturing is higher in Austria, Denmark, Germany, Norway, and Sweden than America. The results suggest a significant negative impact on the Gini index which indicates that codetermination rights lead to higher income equality. Josh Bivens and Heidi Shierholtz, “What labor market changes have generated inequality and wage suppression?” Economic Policy Institute, Dec 12, 2018. Median American household wealth is lower today than in 1984. American firms have exported 5 million high wage jobs since 2000. That’s why the share of their global jobs in the US is smaller than their US share of global sales. In contrast, codetermination German firms bolster the domestic labor market and have created an export behemoth. Only 21 percent of their global sales are in Germany, but 36 percent of their global employees are in Germany. Robert E. Scott, “Manufacturing Job Loss,” Economic Policy Institute, Aug 11, 2015. The United States (multinational firms) lost 5 million manufacturing jobs (net) between January 2000 and December 2014. George R. Tyler, “The Codetermination Difference,” The American Prospect, Jan 19, 2019. America is no longer the land of opportunity. The opportunity for children to out-earn their parents through pluck, ability and effort in Denmark, France, Germany, Norway and Sweden is up to three times greater than for American daughters and sons. Of all rich democracies, America is the best rich child’s country and the worst country to be born middle class or poor. George R. Tyler, “How to establish more balance in the top-heavy U.S. economy,” The Globalist, Jan 21, 2019. While Americans always like to consider themselves exceptional as a nation, in reality it is Northern European adopters of codetermination that are exceptional. Those nations provide the best opportunity on earth for youths by dint of grit, ability and pluck to determine their economic fate. Raj Chetty, etc., “The fading American Dream: trends in absolute income mobility since 1940,” National Bureau of Economic Research, Dec 2016. One of the defining features of the “American Dream” is the ideal that children have a higher standard of living than their parents…. Under the benchmark of copula stability, the fraction of children earning more than their parents fell from 92% in the 1940 birth cohort to 50% in the 1984 birth cohort. Rates of absolute mobility fell the most for children with parents in the middle class. Daniel Aaronson and Bhashkar Mazumder, “Intergenerational Economic Mobility in the United States, 1940 to 2000,” Journal of Human Resources, Winter 2008. We find that mobility increased from 1950 to 1980 but has declined sharply since 1980. Julia B. Isaacs, “Economic mobility of families across generations,” The Brookings Institution, 2016. All Americans do not have an equal shot at getting ahead, and one’s chances are largely dependent on one’s parents’ economic position…. Middle-income children are only half as likely as children from the top fifth to climb to the top themselves (19 percent compared to 39 percent). Moreover, only 6 percent of children born to parents with family income in the bottom fifth move to the very top of the distribution, indicating that the “rags to riches” phenomenon of moving from the bottom to the top of the income ladder is infrequent. Miles Corak, “Inequality from generation to generation: the United States in comparison,” World Press, Jan 2012. Many Americans may hold the belief that hard work is what it takes to get ahead, but in actual fact the playing field is a good deal stickier than it appears. Family background, not just individual effort and hard work, is importantly related to one’s position in the economic and social hierarchy. This disconnect is brought into particular relief by placing the United States in an international context. In fact, children are much more likely as adults to end up in the same place on the income and status ladder as their parents in the United States than in most other countries. Anna-Cristina d’Addio, “Intergenerational transmission of disadvantage: mobility or immobility across generations? A review of evidence from OECD countries,” OECD, 2007. 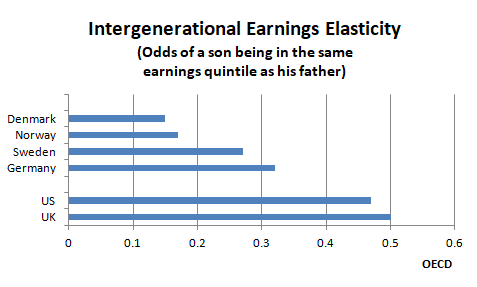 Intergenerational earnings mobility varies significantly across countries. It is higher in the Nordic countries, Canada and Australia but lower in Italy, the United States and the United Kingdom…. Low intergenerational mobility has important policy implications as it implies that the life chances of individuals will partly reflect characteristics for which they are not responsible. Several new studies show parental income to be a better predictor of whether someone will be rich or poor in America than in Canada or much of Europe. In America, about half of the income disparities in one generation are reflected in the next. In Canada and the Nordic countries, the proportion is about a fifth. Felix FitzRoy and Kornelius Kraft, “Codetermination, Efficiency and Productivity,” British Journal of Industrial Relations, 2005, 43 (2) 233-248. We present the first panel estimates of the productivity effects of the unique German institution of parity, board-level co-determination. Although our data span two severe recessions when labour hoarding costs of co-determination are probably highest, and the panel is too short to capture the likely long run benefits in terms of human capital formation and job satisfaction, we find positive productivity effects of the 1976 extension to parity codetermination in large firms. Wolfgang Dauth, Sebastian Findeisen, Jens Südekum and Nicole Woessner, “The rise of robots in the German labour market,” Vox, Center for Economic Policy Research, Sept 2017. Recent research has shown that industrial robots have caused severe job and earnings losses in the US. This column explores the impact of robots on the labour market in Germany, which has many more robots (7.6 robots per thousand workers) than the US (1.6) and a much larger manufacturing employment share. Robots have had no aggregate effect on German employment, and robot exposure is found to actually increase the chances of workers staying with their original employer. 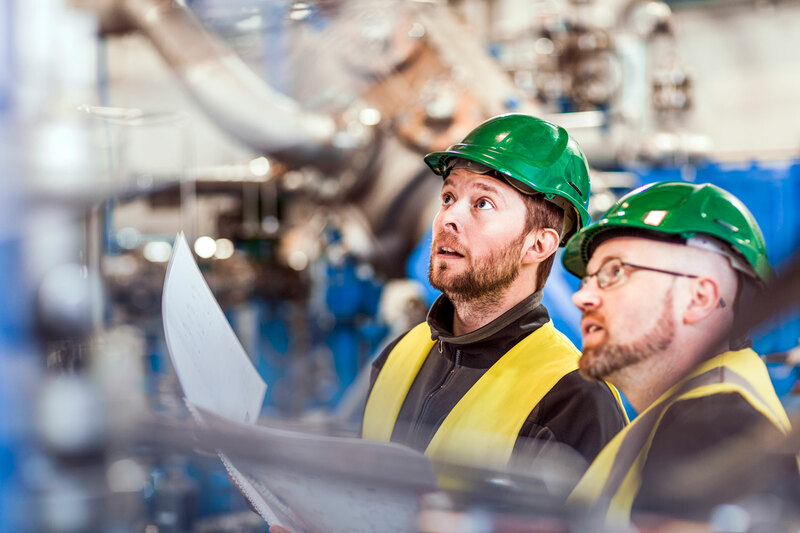 This effect seems to be largely down to efforts of work councils and labour unions, but is also the result of fewer young workers entering manufacturing careers. The codetermined firm has a stronger incentive towards growth than a comparable company without such a bargaining system. Growth is among other factors determined by innovative activity and our empirical evidence is in accordance with this explanation. Summing up, we find strong evidence for a positive impact of co-determination on innovation. The results are relatively robust against different specifications and also the marginal effects seem to be reasonable. Kornelius Kraft and Jörg Stank, “The Impact of Legal Structure on the Innovation Activity of German Companies,” Journal of Applied Social Science Studies), 2004. We investigate the effects of the German codetermination law of 1976 on the innova-tiveness of a sample of German stock companies from the manufacturing industry…. The sample, totaling 1,961 observations, is used for a difference-in-differences estimator on the question of a possible change after the introduction of the codetermination law. We find no evidence in favour of the popular hypothesis that codetermination reduces innovative activity. If anything, it increases it. Larry Fauver and Michael E. Fuerst, “Does good corporate governance include employee representation? Evidence from German corporate boards,” Journal of Financial Economics, 2006. We find that the information that employee representatives bring to the board and the monitoring capability that this information affords significantly improves firm value. (This added value includes providing) …. information that reduces the ability of management to take perquisites or reap private benefits of control. Furthermore, BLER (Board Level Employee Representation) does not have a negative impact on operating performance (specifically on return on assets or ROA) or on stock market valuation (specifically on the Price/Book Ratio). Corporations in the major codetermination nations have earned higher profits than American firms since at least 2000, and profit shares averaged 30 percent higher in 2016. Using a new measure of co-determination strength, the Mitbestimmungsindex (MB-ix), it is demonstrated that co-determination strength is positively related to the presence of ‘substantive’ CSR policies, such as the adoption of targets for reducing pollution, but is unrelated to ‘symbolic’ CSR policies, such as membership in UN Global Compact. American private sector investment is in a long term secular decline according to the World Bank and OECD, reaching the lowest level in half-a-century during 2009-2011. Codetermination firms invest more than other firms and the investment rate of corporations in codetermination countries is 10-50 percent greater than American firms. Sigurt Vitols and Robert Scholz, (German) “Where workers participate, investing is more,” Berlin Social Science Center, Codetermination Index, Böckler Impuls, June 27, 2016. In the years 2006 to 2013, co-determined companies spent more funds on the procurement of durable goods than corporations in whose supervisory board only the shareholders are represented…. Strongly co-determined companies starting from 100 million euro conversion would invest 6 per cent of the conversion, others only scarcely 3 per cent, so the WZB researchers (Vitols and Scholz) found. Daniel Bachman, “What’s the matter with investment?” Deloitte Insights, May 2014. Compared to profits, business investment has seemed remarkably weak. Why are businesses sitting on top of piles of cash, and if business is so profitable, why are they not putting it back into more and/or better capital investment? Marc Lebonte, “Business Investment Spending Slowdown,” Congressional Research Service, April 9, 2018. Average annual business investment spending from 2008 to 2017 was lower than the average for the previous six 10-year periods, going back to 1948…. the business investment slowdown predated the financial crisis…. Jason Furman, “Business Investment in the United States: Facts, Explanations, Puzzles, and Policies,” Council of Economic Advisors, Sept 30, 2015. Reduced capital deepening can account for two-thirds of the below average productivity growth in recent years. Leila E. Davis, “Financialization and the nonfinancial corporation: an investigation of firm level investment behavior in the U.S., 1971-2011,” U of Massachusetts, 2013. The asset side of the balance sheet highlights, first, a sustained decline in the share of fixed capital, raising questions about fixed investment in recent decades. The across-firm yearly median of fixed capital measured relative to sales, shown by the black line in figure 1a, declined 5.3 percentage points between 1971 and 2011, from 24.1 percent in 1971 to 18.8 percent in 2011. Lester Gunnion, “Decoding corporate share buybacks: Is it at the cost of investment? Behind the numbers.” Deloitte Insights, Nov 2017. Reduced capital intensity in key industries helps explain why a lower share of overall profits is being spent on physical investment, therefore allowing firms to use profits, cash reserves, or cheap debt to boost stock values while also returning profits to shareholders. Shareholder value norms inhibit fixed investment by inducing a shift in managerial priorities towards financial targets. A large literature critical of shareholder value ideology has raised concerns regarding the implications of shareholder value norms for a host of key economic variables, including employment, growth, sustainable prosperity and investment. This paper corroborates the claims in this literature, emphasizing a link between shareholder value norms and declining investment rates…. Shareholder value norms have significantly impacted the investment behavior of large firms. William A. Galston and Elaine C. Kamarck, “More builders and fewer traders: a growth strategy for the American economy,” The Brookings Institution, June 2016. While cash distributed to shareholders as a share of cash flow has surged to a record high during the past decade, the share devoted to capital investment has fallen to a record low. Among other consequences, this decline has left companies with the oldest plant and equipment stock in six decades. The average age of their fixed assets is now 22 years, the highest since 1956. Germán Gutiérrez and Thomas Philippon, “Investment-less growth: an empirical investigation,” New York U, Nov 2016. The main contributions of the paper are to show that: (i) the lack of investment represents a reluctance to invest despite high Tobin’s Q; and (ii) this investment wedge appears to be linked to decreased competition and changes in governance that encourage shares buyback instead of investment. Joseph Stiglitz, “Inequality, Stagnation and Market Power,” The Roosevelt Institute, Nov 2017. First, this wealth originating from the capitalization of rents, what I shall call rent-wealth, crowds out capital formation. The weak capital formation of recent years is part and parcel of the growth of rents and rent-wealth—leading to economic stagnation. – 87 percent of executives and directors feel most pressured to demonstrate strong financial performance within 2 years or less. – 65 percent of executives and directors say short-term pressure has increased over the past 5 years. – 55 percent of executives and directors at companies without a strong long-term culture say their company would delay a new project to hit quarterly targets even if it sacrificed some value. – From 2001-2014, the revenue of long-term firms cumulatively grew on average 47 percent more than the revenue of other firms, and with less volatility. Cumulatively, the earnings of long-term firms also grew 36 percent more on average over this period than those of other firms, and their economic profit grew by 81 percent more on average. – Long-term firms invested more than other firms from 2001 to 2014. Although they started this period with slightly lower research and development spending, cumulatively by 2014, long-term companies on average spent almost 50 percent more on R&D than other companies…. from 2007 to 2014, average R&D spending for long-term companies grew at an annualized rate of 8.5 percent vs. 3.7 percent for other companies. -Long-term companies exhibit stronger financial performance over time. On average, their market capitalization grew $7 billion more than that of other firms between 2001 and 2014. Their total return to shareholders was also superior, with a 50 percent greater likelihood that they would be top decile or top quartile by 2014. -Had all US publicly listed firms created as many jobs as the long-term firms, the US economy would have added more than five million additional jobs over this period. On the basis of this potential job creation, this suggests that the potential value unlocked by companies taking a longer-term approach was worth more than $1 trillion in forgone US GDP over the past decade, or 0.8% of GDP per year on average; if these trends continue, it could be worth nearly $3 trillion through 2025. Alberto Manconi, Urs Peyer and Theo Vermaelen, “Buybacks around the world,” INSEAD.edu, Sept 2015. The US economy is 4 x the size of the German economy, yet 4,686 US firms announced a total of 11,096 buybacks from 1998-2010 compared to just 166 German firms announcing 210 buybacks. What is clear to us is that, for cultural and historical reasons, European corporations haven’t used buybacks anything like as enthusiastically as their US peers. Since 2009, buybacks have accounted for a quarter of cumulative EPS (Earnings Per Share) growth in the US, while in Europe the equity gap (capital increases minus buybacks) had a negative impact on EPS. US corporations used 23% of their cash balances in 2016 for buybacks, while in Europe the figure was 5%. Vipal Monga, David Benoit and Theo Francis, “ US firms spend more on buybacks than factories,” Wall Street Journal , May 26, 2015 (pay wall). William Lazonick, “The curse of buybacks,” The American Prospect, Summer 2018. The addition of buybacks to dividends over the past three decades reflects a failure of corporate executives to develop strategies for investing in the productive capabilities of the companies over which they exercise control. The results have been stagnant wages, insecure employment and worker terminations…. Trillions of dollars that could have been spent on productive investment have instead been used to buy back stock in order to boost share prices. Susan Holmberg, Roosevelt Institute Fellow: sholmberg@rooseveltinstitute.org . Stephen Silvia, Professor of International Relations, American University, Washington DC: ssilvia@american.edu. Kent Greenfield, “The stakeholder strategy,” Democracy, Fall 2012, No 26. Steven Hill, “Economic Democracy and Codetermination: Harnessing the Capitalist Engine: How can the European economic model be applied to the United States,” The Globalist, Jan 15, 2010. Susan Holmberg, “Fighting short-termism with worker power,” Roosevelt Institute, Oct 2017. Lenore Palladino, “Why corporate social responsibility won’t be enough,” Roosevelt Institute, Feb 1, 2018. George R. Tyler, “How to defeat Trump in the American Heartland,” The Globalist, July 27, 2016. Katie Allen, “Five ways capitalism can work ‘for all, not just the few:’ How should Theresa May Act on her pledge to reform corporate culture in the wake of the BHS scandal?” The Guardian, July 30, 2016 (Updated Dec 1, 2017). Bennet Berger and Elena Vaccarino, “Codetermination in Germany – a role model for the UK and the US? The idea of codetermination, i.e. the cooperation between management and workers in decision-making, has grown in popularity lately. We review the characteristics of codetermination in Germany and ask whether it could be a role model for the UK and the US,” Bruegel Blog (Brussels), Oct 13, 2016. European Trade Union Institute, Benchmarking working Europe, 2019, Chapter 4 “Democracy at work: less inequality,” Brussels, 2019. Peter Hall and David Soskice, Varieties of Cpitalism (book), Oxford U press, 2001. Larry Liu, “Codetermination: Trade Union Power in Germany and the U.S.,” (Princeton U course background) Feb 2014. Margit Osterloh, Bruno S. Frey and Hossam Zeitoun, “Voluntary Co-determination produces sustainable competitive advantage,” Corporate Social Responsibility and Corporate Governance in: Sacconi L., Blair M., Freeman R.E., Vercelli A. (eds), Chap 12, pp 332-352, Dec 2014. International Economic Association Series. Palgrave Macmillan, London, Dec 2014. Ewan McGaughey, “Corporate law should embrace putting workers on boards: the evidence is behind them,” Harvard Law Forum on Corporate Governance and Financial Regulation, Sept 17, 2018. Lance Coppa, “American exceptionalism,” America, The Jesuit Review, March 12, 2014. Robert Scholz and Sigurt Vitols “Co-determination: a driving force for Corporate Social Responsibility in German companies?” Berlin Social Science Center (WZB), Nov 2018. Includes explanation of the Mitbestimmungsindex (MB-ix) index of codetermination strength in German corporations. A comprehensive list of quantitative studies of codetermination follows on pp 27-29. Sigurt Vitols, “Prospects for trade unions in the evolving European system of corporate governance,” European Trade Union Institute for Research, Education and Health and Safety (Brussels), Nov 2005. Adrian Wilkinson, Paul J. Gollan, Mick Marchington and David Lewin (Eds), “The Oxford Handbook in Participation in Organizations,” Oxford U Press, 2010. Amazon Compendium of books on codetermination. Ewan McGaughey, “The Codetermination Bargains: The History of German Corporate and Labour Law,” LSE Law, Society and Economy Working Papers 10/2015. Walther Müller-Jentsch, “Industrial Democracy: Historical Development and Current Challenges,” Management Review 19, no. 4 (January 2008):260-273. Susan Holmberg, “Want to fix US corporations? Put regular workers on company boards,” Quartz at Work, Oct 23, 2017. Stephen Silvia, “Holding the shop together: German industrial relations in the postwar era,” Cornell U Press, 2013. “Codetermination 2018,” German Federal Ministry of Labour and Social Affairs, Bonn, March 2018. “(Sweden) Codetermination at the workplace,” Innovation and Chemical Industries in Sweden. Jef Degrauwe, et all, “Employee representation and information, consultation and co-determination rights in Europe,” Thomson Reuters Practical Law, Jan 2018. Rebecca Page, “Codetermination in Germany, a beginner’s guide,” Arbeitspapier 33, Hans-Böckler-Stiftung Düsseldorf, June 2011. George R. Tyler, “What America can learn from Europe about income inequality,” Salon, March 18, 2014. European Trade Union Institute, “Worker participation, EU,” current updates.